The curatorial premise of Adam Szymczyk and Elena Filopovic was of a ‘diurnal’ biennale, with an exhibition on show during the day, and different programmed events to happen every night. With four different venues, little or no information available on artists outside of the mediation programme, or labels on works, this strategy acknowledged and emphasised the partiality of the exhibition experience. This was to be welcomed in some respects, as I found that I tried harder to engage with the work than I might normally do, especially considering that many of the artists were unknown to me. However, the flipside of this was that when you did get really interested in an artist or a given piece of work, it was difficult to find out more, or even to remember their name. Participating artists are not foregrounded on the biennale website which results of course in a presentation that is much more curator-centric than artist-centred. Which I suppose is not bad in itself, but I know what side my bread is buttered on. This exhibition was as demanding for participating artists as for the viewer, with the majority of the work being commissioned especially for the biennale and/ or the Berlin context. Berlin is probably now the world capital for art production, with artists from all around the world coming to live and make their work there, typically earning their money elsewhere. There has been a rash of responses to the city’s post-communist legacy too in recent years: both Tacita Dean and Nina Fischer & Maroan el Sani (all of whom live in the city) have made film works in response to the Fernsehturm, for example. Often, these works are made in Berlin and shown elsewhere, redolent with the yellowing glamour of the fading communist past. So the challenge of context is particularly important to this biennale, as some of these artworks ‘come home’ or are exhibited in the place of their making. The works in the Neue National Gallerie faced the formidable task, not of being installed in a white cube, but rather in a clear glass box (designed by Mies van de Rohe, no less). Many of these works explicitly dealt with historical legacies of modernism and/ or communism. What was odd and unexpected for me was how the building’s presence exerted itself on the works: all marble floors, glass walls and wood panelling, it inferred on certain works a distinctly dated decorative aesthetic, and maybe leached out some of their intended irony or criticality. Work that could have been light grew heavy. A standout piece here was Susan Hiller’s The Last Silent Movie, an audio piece projected onto a suspended screen near the centre of the gallery. 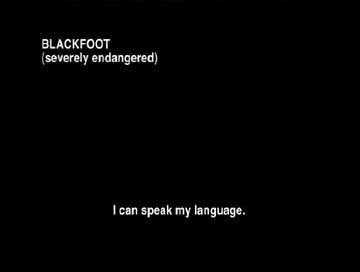 The Last Silent Movie opens the unvisited, silent archives of extinct and endangered languages to create a composition of voices that are not silent. They are not silent because someone is listening… some of them sing, some tell stories, some recite vocabulary lists and some of them, directly or indirectly, accuse us, the listeners, of injustice. In contrast, the work of Turkish artist Ahmet Ögüt, titled Ground Control, was originally made and shown in Istanbul, and the use of asphalt was intended to evoke the looming threats of globalised development in Turkey. The intended meaning of this work is completely illegible in the context of a white cube in Berlin, where the most obvious referents for this gesture would be the Minimalist floor sculptures of Carl Andre, or the incisive interventions by Michael Asher in the lineage of institutional critique. Not to consider how such a work might travel is puzzling. The ‘official’ reading given by the gallery mediators roots the works ‘meaning’ to a fixed origin in Turkey. This attempted rigidity of interpretation is a willful blindspot in relation to the swift flow of global capital and cultural currency. Solid works by Ulrike Mohr and also looked to the city’s recent communist past. Mohr’s intervention consisted of transplanted wild trees from the ruins of the Palast der Republik, placed in the same configuration in the Skulpturenpark. Pedro Barateiro remade two Soviet bus shelters as contemplative reading stations for his pamphlet, The Naked City, which can be read at the artist’s blog. The outstanding work for me at BB5 was Lars Laumann’s video work Berliner Mauer, that followed the marriage of one Swedish woman to the Berlin Wall: she is ‘objecto sexual’ and avowedly apolitical. During the course of the video, she discusses at length her complex sexuality in a tone that accords her a certain gravity and dignity – I at least felt that the artist had treated her respectfully and that exploitation was not at issue in the work. (Much of the commentary, all in her own words, is transcribed from her own extensive website). She describes in detail the almost indescribable despair at the ‘disaster’ of 1989 and also her sexual relationship with her object-husband. Their could not be a much more entangled relationship between the personal (bodily) and the political (albeit denied). 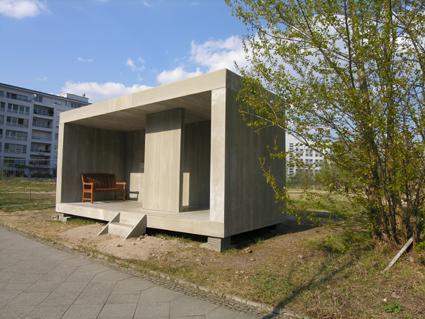 A response to Berlin’s communist legacy that approaches from the side rather than head-on, this work created more possible responses than it closed down.